sews beads, by band, upon a fabric foundation in accordance with a set design to make bead trimming, or upon articles of dress, shoes, lace, etc., for decorative effect. an embroiderer q.v. engaged in embroidering patterns on hose and half hose, usually by embroidery machine. embroiders clocks on hose and half hose, by hand or pantograph machine; sometimes further designated according to thread used, e.g., silk docker. an embroiderer q.v. who ornaments in cross-stitch, by hand, tapestry hangings, chair covers, screens, etc., using crewel thread, a fine worsted yarn. embroiders a design on cloth or garments, using a crochet hook, instead of a needle; cf. crochet worker (375). an embroiderer q.v. who makes or works emblems, pictorial banners, symbols, etc., by sewing textile threads or wire on to cloth foundation, to form a design; sometimes further designated according to kind of work done, e.g., masonic emblem maker, temperance emblem maker. sews over a stamped pattern or otherwise ornaments, by hand, sewing with needle and silk, wool or other kind of thread, usually of various colours, articles of drees, e.g. blouses, underclothing, hosiery, and textile fabrics of all kinds, ladies' hand bags, etc. ; cf. machine embroiderer; sometimes specifically designated, e.g. masonic embroiderer, military embroiderer. an embroiderer q.v. who makes applique work (embroidered designs to be sewn on to dresses, etc. ), either by hand or by cornely applique machine, on a net, gauze or cloth base, the superfluous edges of which are afterwards cut away. embroiders with fine gold wire threaded through an ordinary sewing needle, by hand or cornely machine, on to cloth or other groundwork, according to pattern; cf. machine embroiderer. an embroiderer q.v. who embroiders articles of dress, etc., by cornely, singer or other machine, following outline of transfer placed on material; threads required coloured silks, etc., through needle; controls movements of needle by means of lever, or manipulates article to be embroidered under needle according to type of machine. general term for embroidery workers, but more usually denotes an applique embroiderer q.v. covers a metal shape with gold lace and braid; attaches badge, embroidered by embroideress q.v., and fringe and finishes off. an embroiderer q.v. engaged on elaborate and highly skilled embroidery. finishes or trims embroidery, by cutting off or sewing in loose ends of silk or thread. closes by hand or by hand or power-driven flossing machine, the open ends of cases of boned or steel corsets with bar or fan of silk stitching in a special embroidering stitch similar to oversewing; sometimes uses machine to do additional flossing embroidery or satin stitching. an embroiderer q.v. engaged in working floral patterns. finishes off ends of gores with flowering, or other similar pattern by hand or machine. operates cornely machine by which various types of embroidery, e.g., chain stitch, moss stitch, cording, braiding, are worked; guides machine over transfer by means of handle Tinder base of machine. a cornely machinist q.v. who uses a very fine thread for cording. operates cornely, bonnaz or other tambouring machine to sew an embroidery pattern; cf. cornely machinist. spins metal wire round a fabric foundation on spinning machine; weaves thread thus produced, according to pattern, in a hand loom or weaving machine and twists or plaits wire threads, by hand or machine, to form fringe. an embroiderer q.v. 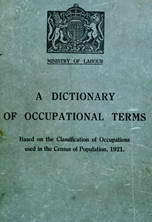 or a crewel worker q.v. general terms for sewer who decorates textile fabrics, including header, crewel worker, embroiderer, etc. q.v. embroiders pattern on fabric, using a Swiss or pantograph machine; with point on metal arm, follows point by point enlarged design; watches correct working of machine as it reproduces design; supervises shuttle girl (429) q.v. an embroiderer q.v. who specialises in embroidering scalloped designs, by hand; cuts away surplus material at edge; cf. scalloper (419). see embroiderer ; cf. sewer (419). an embroiderer q.v. who works designs in silk thread on post cards by hand or by use of pantograph machine; cf. pantographer. an embroiderer q.v. who specialises in working designs of sprigs, usually in form of flowers and leaves. operates a power-driven embroidery machine, guiding hose, or other stockinette garment, under needle of machine in such a way that an even stripe is embroidered upon garment in self or contrasted coloured silk thread. mends any defects in Swiss embroidery, by treadle sewing machine, after material has been embroidered by pantographer q.v., first fixing material in a tambour frame; sometimes also repairs by hand, filling-in parts of pattern.